Don't tell anyone where you found this, because at $400 this is gone the second you mention it to someone else. Secondly, you need a new pccard. That's all. Regarding different mixes: Yes. Depending on what you're trying to do it may require a little piggy magic, but definitely grab that machine. Like, right now. Stop reading this and go get it, you lucky lucky individual, you. The issue is I have no space for 2 months or so then I can. hopefully I can still get it. so like 7th mix or something like that wont flip when only 1 pad is connected? edit: can you explain the pccard I should look for? Check the rhythm game arcade owner's group on Facebook. Also look into a storage facility. You can keep a cab there for a couple months for cheap and a lot of spots will give you the first month for next to nothing. 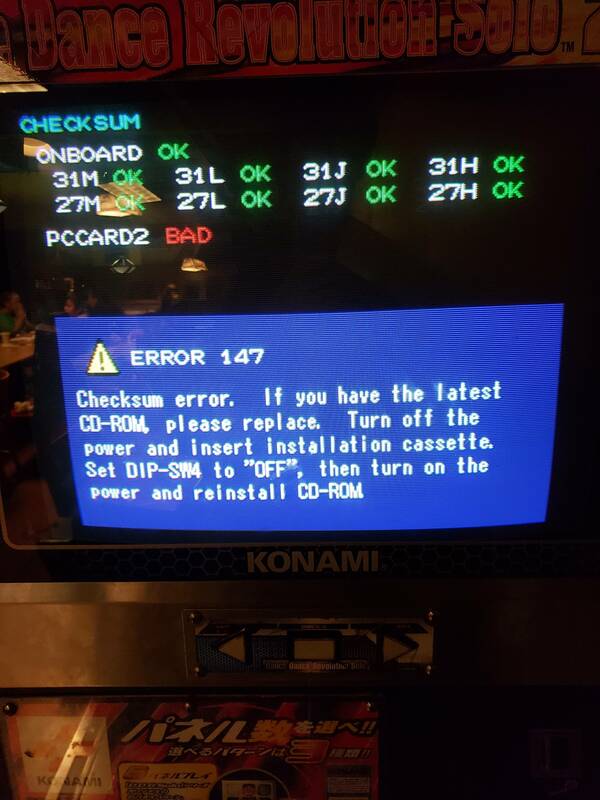 I play DDR Megamix (the Extreme hack) on a solo cab with no issues. It'll work. I can comment on a few things. Ask if he had it worked on recently. The PC card could be in the wrong slot (should be slot 1, not 2 if you're inferring from the boot screen). Can't really confirm the PC card's bad but idk if the CD drive would be worth looking at to see if it's bad. At least for running other 573 mixes, you'll have to rearrange the wiring harness. Solo and Doubles cabinets have different JAMMA wiring harnesses and will result in some buttons being in wrong places and stuck down. So you'll have to get a JAMMA extender and rearrange the wiring. I got a pic of the differences in the JAMMA harnesses for both cabs somewhere.